Demand is rising for electronic systems in new cars with increasing attention focused on self-driving (autonomous) vehicles, vehicle-to-vehicle (V2V) and vehicle-to-infrastructure (V2I) communications, as well as on-board safety, convenience, and environmental features, and growing interest in electric vehicles. Automotive electronics is growing as technology becomes more widely available on mid-range and entry-level cars and as consumers purchase technology-based aftermarket products. For semiconductor suppliers, this is good news as analogue ICs, MCUs, and a great number of sensors are required for many of these automotive systems. The automotive segment is expected to account for an estimated 9.1% of the $1.49 trillion total worldwide electronic systems market in 2017 (Figure 2), a slight increase from 8.9% in 2015, and nine percent in 2016. 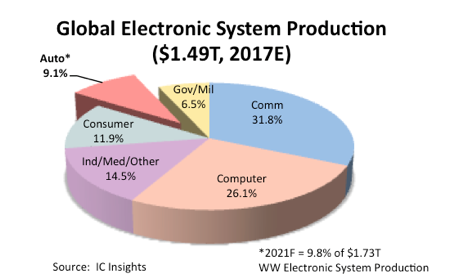 Automotive’s share of global electronic system production has increased only incrementally through the years, and is forecast to show only marginal gains as a percent of total electronic systems market through 2021, when automotive electronics are forecast to account for 9.8% of global electronic systems sales. Though many electronics systems are being added in new vehicles, IC Insights believes pricing pressures on both ICs and electronic systems will keep the automotive end-use application from accounting for much more than its current share of total electronic systems through the forecast period. Other electronic system and IC market highlights from the 2018 IC Market Drivers Report include the following. The automotive segment is forecast to be the fastest growing electronic system market through 2021. This is good news for the total automotive IC market, which is forecast to surge 22% in 2017 and 16% in 2018. Industrial electronic systems are forecast to enjoy the second-fastest growth rate (4.6%) through 2021 as robotics, wearable health devices, and systems promoting the IoT help drive growth in this segment. Analogue ICs are forecast to hold 45% of the industrial IC market in 2017. The 2016-2021 communication systems CAGR is projected to be 4.2% as global sales of smartphones and other mobile devices reach saturation. Asia-Pacific is forecast to show the strongest regional growth of communication systems and account for 69% of the total communications IC market in 2017. 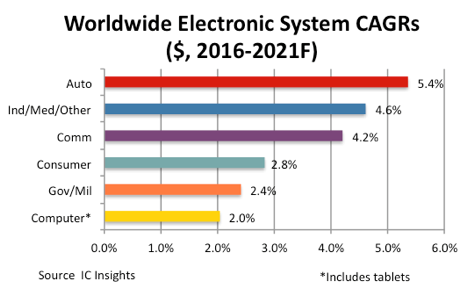 The consumer electronic systems market is forecast to display a CAGR of 2.8% through 2021. The logic segment is forecast to be the largest consumer IC market throughout the forecast. In total, the consumer IC market is expected to register a 2.4% CAGR across the 2016-2021 time period. Flat or marginal demand for personal computing devices (desktops, notebooks, tablets) is expected to result in the computer systems market showing the weakest CAGR through 2021. The total computer IC market is forecast to increase 25% in 2017 driven by much higher average selling prices for computer DRAM and NAND flash memory.